We arrived in France on Saturday afternoon after an uneventful flight from Seattle to Reykjavik, Iceland, to Paris. Initially, this did not seem like an agreeable flight choice, but it was the least expensive one, and so it was booked. As it turned out, my only complaint was the lack of sleep we had during our flights. Perhaps this will work out to help offset jetlag. The Reykjavik airport was quite nice and modern and had we not had to rush to our next flight, some exploring might have been done. Our only meal during our trip, the 24 hours between the lunch we had before leaving for the airport and the late dinner we had Saturday night, was a ham and cheese sandwich purchased on board our flight. Though it was not offensive, it left much to be desired. Stella, in her brilliance, brought a Cup ‘o Noodle in her backpack. When she pulled that out, I looked on with envy, thinking perhaps I could get a sip of the soup at the end. My hopes were dashed when she somehow spilled the last bit in her own lap. Perfect. Once in Paris, our only goal was to stay awake until dinner. We arrived at the apartment we rented just off the Champs-Élysées, by the Arc de Triomphe and were happy to find it was exactly as pictured in the rental listing. After unpacking, we headed out to explore the neighborhood and found a lovely boulangerie, patisserie, restaurants and several cafes within a few minutes walk. We stopped into a nearby café for a libation and then back to the apartment to dress for dinner. Dinner was perhaps a tourist trap, but we like it. Le Relais del’entrecote is the birthplace of one of our favorite steak sauces. It is a prix fixe menu with a green salad, steak frites and pommes frites served with their creamy herb steak sauce. They serve your meal in two halves. They bring you half your steak, fries and sauce, and then once you are finished with that, they bring you the second half, all in an effort to keep everything warm. This is a place that must be basically printing money in the kitchen. Always a queue, must be an easy inventory to track, and your cooks do not have a tremendous amount of preparation and cooking to learn. Brilliant. After dinner we took a long walk back to the apartment where we quickly found ourselves fast asleep in our beds. On Sunday morning, Chris and I awoke at a decent hour after a good night’s sleep and set out to bring back breakfast while the girls slept. 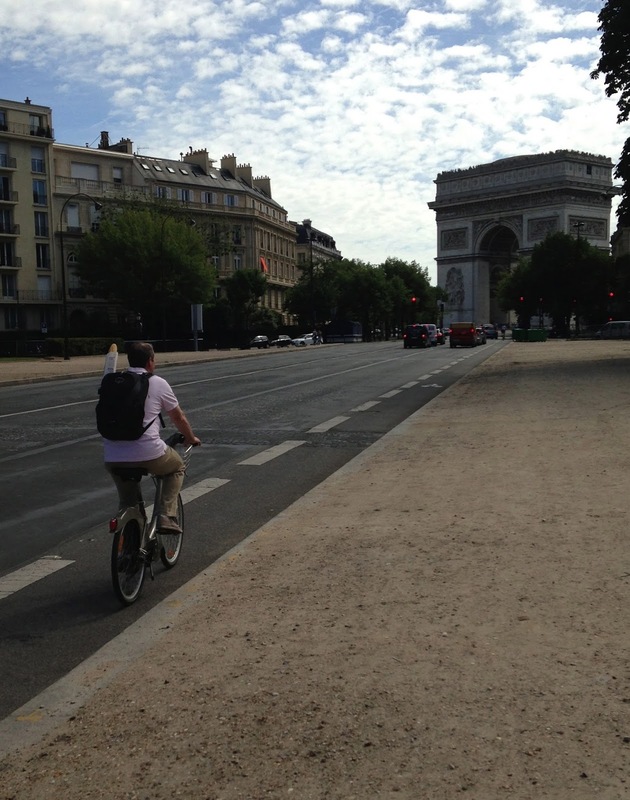 Throughout Paris, there are Velib bicycles available for rent. Pick up one at one station, return it at another close to your destination. Chris had gotten us all a week-long pass and wanted to give it a try. Off we went to pick up our bicycles, and oddly, not to the boulangerie around the corner as I was expecting. We got our bikes, rode to a different boulangerie Chris had resarched and found it to be closed. Back we went to the one close to our apartment. Again, closed. It was Sunday after all. Back to the station to return the bikes and then off to the store around the corner to hopefully not go back empty handed. The grocery store baguette was 0.80 Euros, or about one dollar U.S. A baguette, some butter and strawberry jam with a few slices of parma ham made for Stella’s favorite breakfast of all time. Not bad. Breakfast for four, about eight euros. Happy day. After breakfast, we leisurely set off for our electric bike tour. We picked up our 4 Velib bikes to ride to our meeting place for the tour. Paris is mainly flat, making it quite pleasant and easy to ride around. It does call for a little more attention as you are mostly riding with traffic and no helmet. Having arrived safely, we met our tour guide, Paris Charms and Secrets, picked up our electric bikes, and set off for a four hour ride through Paris to all the main sights. As many shops are closed on Sundays, this was a good day to do this and it gave us a good lay of the land. Our tour finished at 6:30 and back to the apartment to freshen up before dinner. On our list, and recommended to us by more than one person, was Le Stella. After just one day in Paris, Stella has noticed mostly everyone in France looks quite fit. And after just one day in Paris, we know why. The walking. It is so pleasant to walk everywhere. Where back home we would normally jump in our cars for that one or two mile jaunt, here you do not give it a second thought but to walk. Le Stella is a brasserie serving many classic French dishes. I had the steak tartare which was very nice. We couldn't help but wonder, however, if we were perhaps seated in the 'American' section of the restaurant. Once we sat down, we realized we were going to have to listen to two American women talking loudly for most of our meal. This was offensive and I could see why they were seated away from the 'locals', but apparently we were immediately typecast to be the same as them. Perhaps this was a coincidence. But when those two women finally left, another group of three Americans were seated next to us. Perhaps they were trying to be nice, seating us next to our country folk. Hmm. The service was friendly and we enjoyed our meal, but a little was lost because of our seating position. I suppose this would be the case anywhere we went when seated next to folks imposing on the peace of our experience. After dinner, we strolled back to the apartment with a quick stop at the Häagen Dazs. A stellar day in Paris and ready for bed. I've been following your blog since 2010! Needless, to say, I LOVE it, but have always been quietly reading. Since you're in Paris, and I know you know your food, I was hoping that you could do a review on canelés and possible post a good tutorial for at home? No worries if it doesn't come up, just thought I'd try. Have a fun and safe trip! Hi Deiree, I will search out a few different caneles and report back! Marcel, we are a couple of streets off the Champs-Elysees, but nice view out the window nonetheless! Mary, not to add to the already long list I sent you but here is something hot off the press from my friend who has been living in Paris for 3 years. Some repeats but not many. Have fun! A great Paris bistros. It was beloved by Julia Child when she lived here. Good for a group. Le Dôme Montparnasse - classic bistro - seafood. Julia Childs ate there. Brasserie Lipp - Saint Germain de Prés surrounded by Café de Flore and Deux Magots, need I say more? classic brasserie in a great neighborhood. Good for lunch or dinner. Chez Omar (Moroccan) 47 rue de Bretagne in the 3rd. They don't take reservations or cc's It is fun, different kind of place in the Marais. Great food and fun people watching. Vivant Table 43 rue des Petites Ecuries in thé 10th. Modern french market based cooking, renowned chef, casual. In the "golden triangle" .. it is elegant and contemporary Japanese. Surprising and delicious. Le Grand Véfour inside the Palais Royal, classic french, very historic. Frenchie A very popular restaurant, hard to get a table but it is an ultimate Parisian experience. Great food, small and personal. very cool. (http://www.frenchie-restaurant.com). Chez Janou (2 rue Roger Verlomme) is near there, it is a bistro and very classic. No stress near Place des Vogues. Near the Louvre I would go to Willy's Wine Bar. Then walk over to rue Saint-Honoré for the best shopping in Paris. Also along rue Saint-Honoré is Hotel Costes a fashionable 5 star hotel with a great bar and lounge, lunch or a before dinner drink in their courtyard is an unforgettable experience. My favorite chocolate and hot chocolate in Paris comes from Jean-Paul Hevin at 231 rue Saint-Honoré. Also in that neighborhood are the ultra chic shops in the Palais Royal. Near Musee D'Orsey and the Musée Rodin It would head toward Cafe Constants on Rue Saint Dominique. It is open all day and casual. This will also get you to a great neighborhood. I would recommend walking down rue Cler, one of the best market streets in paris. Also Café Central on rue Cler is cool, great place to stop and have a cafe or wine and people watch. Chez L'Ami Jean There is also there is Montparnasse 1900 in this area. It is on the registry of historical monuments, it has an amazing art déco stained glass ceiling. After the Centre Pompidou lunch at Restaurant Georges which is on the 6th floor is great with spectacular views over Paris. Also would be great for dinner. Also at the Palais du Tokyo (a contemporary art museum in the 16th) there is Tokyo Eats which is great for lunch. I know I'm going on and on but the list would not be complete without mentioning L'As du Fallafel (good for Sunday because it is open and lively, when other areas can be closed up) and the restaurants that surround the Place des Vosges in the Marais. A fun place to walk around and see an great old part of Paris. Angela, that is one big list! Thank you! I will keep it and see if we can get to any of the places if we are nearby. Merci!